It may not be the use of words expressing something than their literal intention, but this review is irony. Sometimes the responsometer imbues pure elements with life - other times (specifically, in the '90s) the robots were blanks, and had the personalities of random humans who had been killed in an accident in Doc Magnus's lab. Thankfully, that's been removed from history, proving that for as stupid as Superboy punching time may have been as an idea/excuse, it did have some good benefits. Iron is the team's strongman, and so uses the basic "large" body. Presumably. It's hard to tell under his fancy little sundress, a soft rubber piece floating over the torso. 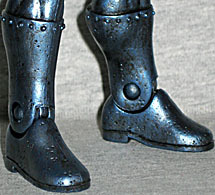 He does get new forearms and shins, as evidenced by the rivets around the upper edges of his gloves and boots, but you can bank on seeing those again with the rest of the Metal Men. Well, most of the rest of them. It seems unlikely, but he feet are new, as well: no one else has had that pitted texture on their shoes. Presumably the idea behind the smock was that it would allow Mattel to duplicate the classic look without having to sculpt a whole new body (mission accomplished) or sacrifice any of the usual articulation (mission failed). The chest joint still exists behind there, but don't expect to be using it any time soon - it only moves a little bit, and the drape wants to push it back to where it was. The front has a riveted V with the shield and spear of Mars inset. Yes, that's also the symbol for "male" - Mars is associated with war, and therefore both those who go to war (men) and the tools with which they do it (weapons, which were made of iron). Thus the symbol. 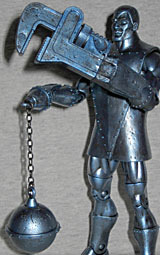 Iron is painted a metallic blue, as he's usually shown in the comics. It seems he was intended to be dark grey, but like Hulk, had to be changed because coloring technology of the time couldn't cut it. It's also an unintentional reference to the color Prussian blue, which is made with ferric ions. He has a very large jaw and prominent features, with a slightly devilish smile on his robotic lips. 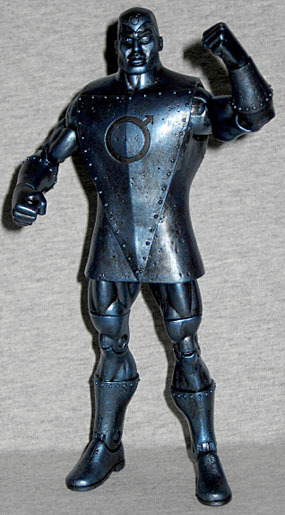 It was announced, fairly early on, that each of the Metal Men would come with some real metal pieces. The rumor mill swiftly spun this into "the figures are really made of metal!" but that's not true. Iron himself is plastic, just like you'd expect; his accessories, however, are a blend of plastic and the promised metal. He has two slip-on hands, much like Metamorpho, to show his shape-shifting powers. The right hand is a heavy ball and chain, and the left is a (functioning) pipe wrench. No, seriously: turn the dial, and the adjustable jaw actually moves, and will stay at whatever size you set it. The bits that fit over Iron's fists are plastic, but the remainder of the accessories are metal. For such a manly element, Iron sure is a feminine toy! He's wearing a dress, and his BAF piece is wearing a go-go boot! Yes, this set includes Darkseid's left leg, and while we're sure the assembled figure will look awesome, it's a bit hard to be intimidated by a spaceman wearing thigh-highs. The set also includes a DC 75th Anniversary collector pin, the year-long gimmick Mattel is foisting on us. If they really wanted to make them collectable, they'd have numbered them, so you knew which ones you were missing. If it's good enough for baseball cards, it's good enough for cheap chips of plastic! This one takes its art from All-Star Comics #43, which does feature metal men, but not the Metal Men. Credit where credit's due: Mattel may have a lot of problems, but they're pretty good about using the DC Universe line to build "teams" - they're already 60% of the way through the Doom Patrol, and Iron is just the first Metal Man to be released. By comparison, we got Sasquatch from ToyBiz, Guardian from Hasbro, and never anyone else on the Alpha Flight team. Iron is a prime example of what fans have come to expect from Mattel: a figure that's decent, but not great, and has at least one annoying flaw. But hey, at least his neck balljoint works the way it's supposed to.